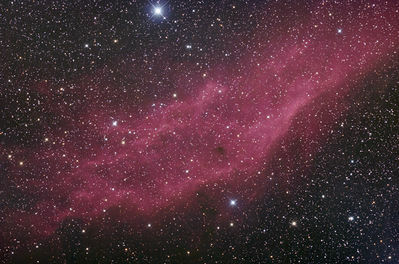 NGC 1499, aka the California Nebula, is a diffuse nebula found in the constellation Perseus. The nebula, which is composed primarily of hydrogen gas, was discovered by E. E. Barnard in 1884 using a 6-inch refractor. The image is a total exposure of 3 hours 5 min (37 x 300 sec lights) using a Takahashi E-180 astrograph and a Canon 20Da DSLR at ISO 800 (30 darks, 67 flats). Image processed using Images Plus 3.82b and Adobe Photoshop CS5.